The Faculty of Law’s longest serving female academic—and one of the leading feminist scholars within the discipline of law in New Zealand—Associate Professor Elisabeth McDonald is heading south after 27 years at Victoria. In 2014, a 25 year reunion was held for Elisabeth’s first class. 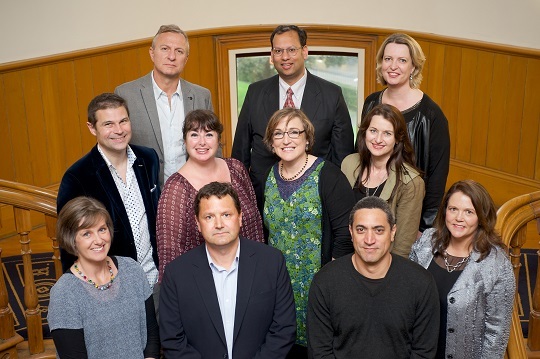 Elisabeth will take up a Chair in Law at the University of Canterbury from the end of November, but will stay connected to Victoria through her work with the Feminist Judgments Project Aotearoa and other collaborative research. Pro-Vice-Chancellor Professor Mark Hickford says that while there are many positives for Elisabeth regarding the move, the Faculty will miss her many contributions. “In particular, her teaching, student support and her work in the wider community, especially regarding rainbow legal issues, her long-standing service to survivors of sexual violence and her commitment to law reform in this area. Elisabeth’s association with the Faculty of Law at Victoria began in 1985, when she enrolled for a Bachelor of Laws, and went on to become one of three Victoria University Senior Scholars to graduate in May 1988, along with Hon Justice Matthew Palmer. As a student she was awarded the Kensington Swan Law Scholarship, the Rudd Watts & Stone Prize in Commercial Law, the Law Book Prize in Jurisprudence and the AH Johnstone Scholarship in Law. After an interlude in Washington DC (as part of the New Zealand Jessup Moot team, along with Francis Cooke QC) and the University of Michigan, where she completed a Master of Laws while on a Fulbright Scholarship, Elisabeth returned to Victoria in June 1989 as a temporary lecturer, a position that was made permanent in January 1990—the year she had her first child. She was promoted to Senior Lecturer in 1995 and to Associate Professor in 2005. Elisabeth worked at the Law Commission on secondment for two years between 1996 and 1998, on both the women’s access to justice project and evidence law reform—an area in which she has subsequently published extensively—both generally, and in the application of evidence law to the particular problems associated with sexual and family violence. Her research is informed by four distinct subject areas; criminal law, the law of evidence, law and sexuality and feminist legal theory. Her published work, including books, refereed journals, book chapters and other writings, discusses aspects of all four subjects in order to develop original reform proposals. Over her 27 years at Victoria, Elisabeth has also taken on many administrative roles, including Dean of Students, Honours Co-ordinator, Director of Post-Graduate Studies, and convenor of the 2008 Curriculum Review. She introduced and taught Feminist Legal Theory (in 1990) and Law and Sexuality (in 2001), and was awarded a teaching prize for significant innovation (in 2002) for the use of journals as an assessment tool. She was recognised last year with a Staff Excellence Award for her 25 years’ service to Victoria’s Faculty of Law—a fitting honour for the outstanding contribution she has made.